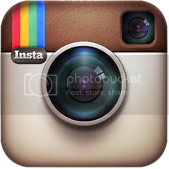 Reading Resolutions - Will 2014 be your year? As January reaches its closing date, my mind keeps wandering to the New Year's resolutions that aren't going to see February. Remember how simple our resolutions were on December 31st? We wanted to eat better, have more experiences, take more vacation days, exercise more, save more money...and now the cold weather and the start of the new year make those resolutions more daunting. To this I say - take heart, furious readers! You CAN meet your resolutions and you can succeed in 2014. You can get your "more." But may I suggest just ONE more resolution to add to your list? #1 "Read a a classic novel" - this reading resolution is one of the hardest to do. We all know that we should read a "classic novel," but what exactly counts as a classic novel? The OED defines "classic" as a period of time labeled as the "most outstanding" of its kind. Just the definition sounds intimidating - especially to readers who don't make it a habit of reading classics (since this is a part of my job, I forget that classics are considered "homework" to the mainstream culture). Most classics are blamed for being too boring or too outdated, but reading a classic work can be rewarding and inspiring - as well as a historical experience. The learning experience from reading a classic cannot be compared to anything else. Some of my favorites: To Kill a Mockingbird by Harper Lee; Wuthering Heights by Emily Bronte; 1984 by George Orwell; Anna Karenina by Leo Tolstoy; A Tale of Two Cities by Charles Dickens; Dracula by Bram Stoker; and The Picture of Dorian Gray by Oscar Wilde. Once you work your way through the mainstream classics, you can discover the lesser-known works by these authors or attempt to read those classics that everyone claims to read, but can barely make it through Ulysses (the famous James Joyce masterpiece - this is not a terrible book - in fact it is fascinating and exciting - but beware the reader that claims Ulysses is his/her favorite book. Chances are that person is lying), War and Peace (Leo Tolstoy), Foucault's Pendulum (Umberto Eco - this is so worth the read), Nightwood (Djuna Barnes), or The Waste Land (T.S. Eliot). If these oldies are too much to start, then try a contemporary classic such as Kurt Vonnegut (Cat's Cradle, Slaughterhouse Five) or Toni Morrison (Beloved, Jazz, Song of Solomon). #7 "Shop at your local independent bookstore" - Shopping locally is great no matter where you go, but frequenting a local bookstore allows you to form a friendship with the owner. My favorite part of my week is going to my booktrader, and I've enjoyed every recommendation that she's given me. One day we were discussing whether or not we liked a particular series, and she said passionately, "If you don't love this book as much as I do, I will refund your money." I love that! And she was right - I did love the book as much as she did. I was honored that she took a chance on me. #11 "Set a book reading goal" - I read once that Stephen King reads 100 books a year. I've read a memoir where the author read a book every day for a year. With everything I have to do, I don't always reach my book goal, but I usually read between 50-75 novels a year. If you're new to the reading goal idea, pick five to ten books that you've been meaning to read and work through that list. Even if you don't reach your goal, your reading time was never wasted. 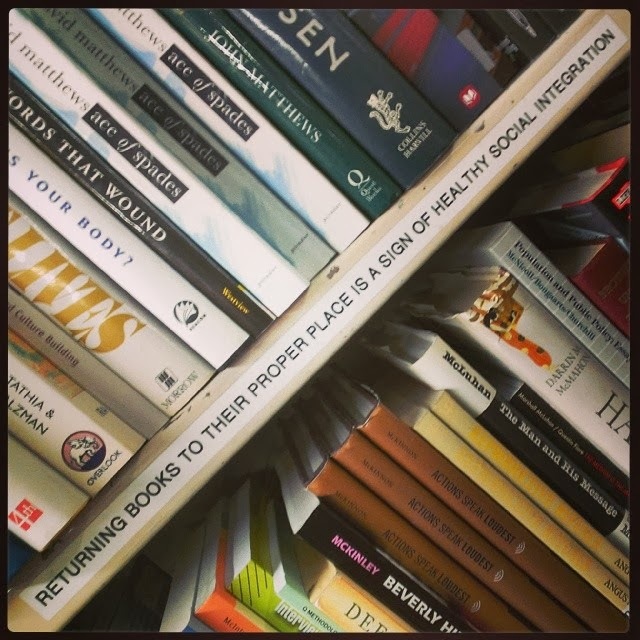 #13 "Get the non-reader in your life to start reading" - Every year I like to participate in World Book Night, which promises to spread "the love of reading, person to person." If your application is accepted, you have the opportunity to pass out books to non-readers. But even without World Book Night, you can celebrate this gesture by sharing something from your bookshelf. Over the weekend, a friend of mine confessed that she needed to read more so I brought her a Willa Cather novel that I enjoyed. I love Cather, but I didn't need this novel anymore - it deserved to have a new home. She was so excited, even though she confessed that it may collect dust at first. : ) I told her what I tell all non-readers, "When you are meant to read it, you will." Reading isn't about pressuring someone or making yourself seem better than others - it is about spreading joy and knowledge, which should be available to everyone. Sometimes a person doesn't read regularly because he/she doesn't know where to start - it is up to the furious readers to serve as guides for their new journey. 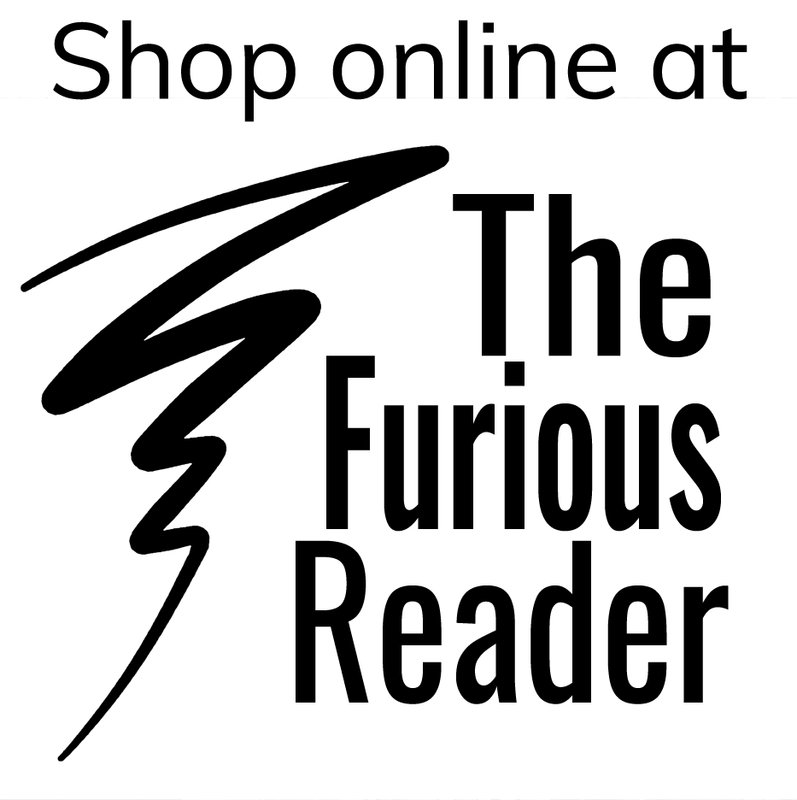 Continue to read furiously in 2014! Eleven more months to go! Before I read Mary Beth Keane's Fever, I had never heard of Typhoid Mary. I've heard the expression, but I wasn't aware that she had been a real, living person. I also don't read too much historical fiction, so I'm not sure what made me pick up this novel. But I'm really glad that I did. Keane's story takes place in 1907 New York and touches on difference pieces of thematic content: fears of the plague; women in power being brought down by powerful patriarchs; New York as a growing metropolis that barely has a place for its inhabitants; the abuse that many immigrants had to put up with in order to make a "better life" in America; the conflict between science and superstition; and (naturally) the power of food. Obviously, Keane's Mary is the person responsible for our phrase "Typhoid Mary," but this novel pulls her out of the one dimensional character from our history books. Mary lives in a small apartment in New York with her partner, Alfred - an alcoholic who is constantly out of work. Mary and Alfred don't see a reason to get married (which already sets up her character as one who refuses most social conventions of the time), but instead cultivate a partnership where they rely on each other to make their little apartment a beautiful home. The novel begins with Mary away at a job as cook and trying to save her employers and their son from typhoid fever. Mary fails to save the lady of the house and her son, and this moment of watching the little boy die will stay with Mary for the rest of her life (and reappear in her darkest days). Mary returns to New York to get a job closer to home and settles back into the life she had before this traumatic event. At her new position as head cook of the kitchen, Mary is visited - actually she is kidnapped forcefully - by Dr. Soper and his medical team. The real reason is not explained to Mary at first, and when it is explained, it makes less sense to her and the reader: Mary is responsible for being a "carrier" of the bacteria that causes typhoid fever and the only way to prevent more people from dying is to keep her isolated on an island off of Manhattan where she can never rejoin society again, but be forced to take a lot of tests. Dr. Soper hopes to make a name for himself in the medical books by proving that Mary passes the disease through her cooking. He treats Mary like the lab rat that he thinks she is and even goes so far as trying to bully her into giving up her gallbladder for study (as someone who had their gallbladder removed last summer, the thought of having it removed in the 1900's makes me want to faint). Mary, being the headstrong woman that she is, refuses to give in to Soper. We applaud her, but then cringe when we discover that Mary will be stuck on this island for the rest of her life. Soper will just wait for her to die so he can harvest her organs; it may take a long time, but Mary's punishment for not giving in to those that "know better" (AKA the male doctors) is to lose everything she loves. Since this is the early 20th century and Mary is a poor immigrant who struggles to find work, we can see how Dr. Soper's hypothesis can destroy Mary mentally, physically, and financially. Her reputation, her relationship with Alfred, her little apartment and the rest of her life is at stake and Mary can barely make sense of it all as the doctors take advantage of her lack of education and keep their information from her. Luckily, Mary has strong survival skills and manages to get the information she needs in order to make a case against Soper. A few parts of the novel are taken from actual court documents as Mary takes her captors to court to win her freedom. It's a longshot - an unmarried, poor, Irish cook against powerful, successful American doctors - but Mary wins...sort of. She will be released from her hospital prison as long as she promises never to cook again. Despite her best efforts, Soper still manages to win this battle. Mary is devastated; she spent a good amount of her life working her way up to her position in the household and she is proud of her pay and her power over her small space. Also, Mary needs a job since Alfred's addiction makes it difficult to support them. To Mary's horror, the court suggests that she finds work at a laundry. Even in our 21st century worldview, we know what the court is asking Mary: to give up everything you worked for and take a pay cut, along with a class cut. This conflict of ideas between Mary, and others like Mary, and those in "charge" show the socioeconomic dissonance that drove Mary's world and continues to drive our world. If the reader wasn't already sympathetic to Mary's situation, he/she is now as Mary struggles to make the best of her new normal. On top of her humiliation trying to find work as a laundress (it may be below her pay grade, but she still needs experience and references), Mary loses her home and Alfred. Between Mary's imprisonment and her trial, years have passed and Alfred is now engaged to another woman (this is a very tricky moment in Keane's narrative - it is obvious that Alfred does not love this new woman and we don't get to see much from his point of view, but it does beg the question if he did this in order to survive after Mary is taken away). If you know the story of Typhoid Mary, you know that Mary does not have a happy ending. However, Keane's fictionalized account makes her real to us and forces the reader to struggle with the morality of Mary's decisions. Cooking is her life, but there is a chance that she may be a carrier. Does that mean her actions are justified? (Mary fears at certain points that she may have killed her employer's young son with her cooking). What would you do for survival? How can you create a happy ending in a city that is ready to toss you aside? There is a moment in the novel where a milkman is discovered to be a carrier, but he isn't taken away because he has a wife and family. Is Mary a target due to her gender, class, and nationality? Is she another casualty in a long list of powerful, outspoken women who are blamed for bringing a plague upon her village? This may be fictionalized account of a true story, but I found too many truths to remind myself that this is all make believe. NOVA created a great archive of Mary's story titled "The Most Dangerous Woman in America." If Mary Mallon's story speaks to you, this is worth checking out, as is Mary Beth Keane's Fever. The site includes the letter Mary wrote to the courts in 1909, which Keane has included as a major point in her novel (this is how historical fiction should be done. I understand that the writer gets to take liberties, but Keane shows a level of ethos and pathos that isn't always apparent in this genre. For that, I respect her work). To have Mary labeled as "the most dangerous woman in America," makes me wonder in which way is she the most danger to her environment. Like her dishes described in Fever, Mary was full of flavors. I'm glad to see that she finally has a voice and a time period that is willing to listen to her side of the story. It was about four years ago that I ordered my first set of real business cards. A few of my short stories had been published in different anthologies, and it seemed that I needed to start playing the part of a professional (even if the title was a bit premature). 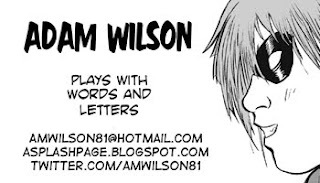 So I laid out my my name, contact information, added some sketches from my more memorable stories, but there was something missing. I couldn't put Comic Creator, since my lack of artistic abilities will forever leave me being at best one-third of a Comic Creator. And while I suppose I could have put Comic Writer on there, that somehow felt inaccurate. I didn't want to think of myself as just someone who just wrote comics. The problem, I eventually realized was that I wasn't looking for a title but something more definitive. Something that summarized just what it was I wanted to do whenever I sat down behind my keyboard. Whether I was writing or lettering or editing, I wanted something that captured just how much I loved the written word. So finally, after a little bit of brainstorming, I figured it out. It sounded perfect, I wasn't just someone who worked with words, I played. I found joy in them the same way a child would in a toy. I experimented with them just as a musician might their instruments. I played with words and letters. And that my furious readers, is what brings me here today, so we can continue together in one of the greatest games ever - the written word. I wasn't familiar with Penelope Fitzgerald's work - just Ms. Fitzgerald. I knew her literary career did not begin until she was 58 and she went on to write many well-received and awarded pieces of fiction and nonfiction. So it wasn't a surprise to find her protagonist, Florence Green, to be a middle-aged woman trying to begin a new stage of her life. But let's return to the cover. The cover offers a very romantic notion of owning a bookshop - you can see all of the books tucked away in corners or on shelves offering a well of knowledge to the customers. Doesn't it sound lovely? The back of the novel promises a tale of "courage" and "survival." I've always wanted to own a bookshop (and what furious reader does not wish the same fate? ), so I fell into the romanticized idea of Florence Green as an aspiring bookseller. I am happy to report that this is not what the book is about (Fitzgerald is a more talented writer than that). The only character who shares my romantic notions toward bookselling is Florence herself and it doesn't work out for her in her town of Hardborough. You would think that a middle-aged woman opening a bookshop in her small town would not be a cause of controversy, but the characters in this novel take her enterprise as a personal affront. Florence is rebuked for her dream and many characters go out of their way to ruin it for her. Now Florence may love the romantics behind running a bookshop, but she has to deal with lack of sales, indifference from her patrons, indifference from her town, lack of concern from the bank, her lawyer, and her employees, and an old, waterlogged house where she resides and runs her business that is home to a very nasty poltergeist (I know that last bit sounds strange, but trust me, you could have field day doing an literary analysis of this one detail. The poltergeist is viewed as a piece of realism, in which Florence and the townspeople are aware of its presence, but only in the worst possible moments of the narrative). Yet, Florence continues to press on with a determination that is viewed as a stubborn courage for a woman "her age," but is actually a desperation to survive despite the world trying to take her down. Florence continues to hope that the "power of books" will save her and her shop, and the reader wishes that for her, but Fitzgerald is here to remind us that a success story needs more than dreaming. As much as I want to, because the last sentence of the novel is so heartbreakingly beautiful and sad and horrifying and upsetting all in one, I will not give away the ending to Penelope Fitzgerald's The Bookshop. No, Florence does not die, but the narrative shifts in the last two chapters and offers a newer story. The end narrative will continue long after Florence goes or any bookshop comes and goes. This new story is about the harsh reality of rejecting the knowledge, the culture, and the hope that comes from reading. Florence's plight is no different than anyone who struggles to make an impression on his/her environment. Like all independent businesses, Florence's bookshop has the opportunity to breathe life into the local atmosphere - she hires a young person to help her in the store; she opens up a lending library for patrons; she even listens to recommendations from patrons. However, all of Florence's actions are met with a heavy resistance. The animosity she receives for trying to begin a new stage in her life while bringing a bookshop to her town is astounding. 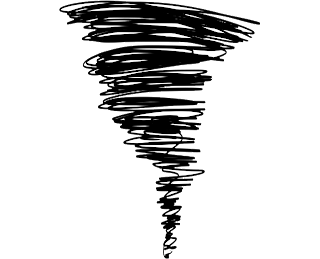 The antagonist, Violet Gamart, pulls out all the stops to discredit and to discourage Florence. Her strength to continue is interpreted as headstrong, which only infuriates Violet. The reader sees Florence's strength as a struggle to make a livelihood - not just for herself, but the citizens of Hardborough. The indifference and selfishness that meets Florence at every turn reminds me of the hate culture in which we reside. Everyone is so willing to cut someone down to size - even if that person is minding his/her own business. Florence is described as having a "kind heart, though that is not of much use when it comes to the matter of self-preservation" (Fitzgerald). This the author's way of telling us from the first page that Florence is in trouble. Sure enough, the citizens prove the narrator correct by choosing to abuse and to take advantage of Florence at every turn. There are a few characters who do support and care for Florence, but end up suffering due to situations beyond their control (though the reader is left wondering who IS in control when their fates befall them). As a universal culture, we love watching the train wreck. The protagonist's attempt to beautify her town is a train wreck the reader is forced to experience. What does the bookshop represent to the Hardborough citizens? Sometimes the characters' scheming reminds me of something out of a soap opera. Why all the fuss? Where is the loyalty among local business owners? Is it just jealousy or something more? As the narrative approaches its ending, the reader feels let down, yet satisfied. To make this narrative into a cheerful ending would be an insult to Florence, the reader, and to Fitzgerald's body of work. Is The Bookshop a cautionary tale? And if so, for whom: small business owners, older women attempting to start over, or anyone who wishes to defy convention in a narrow-minded environment? 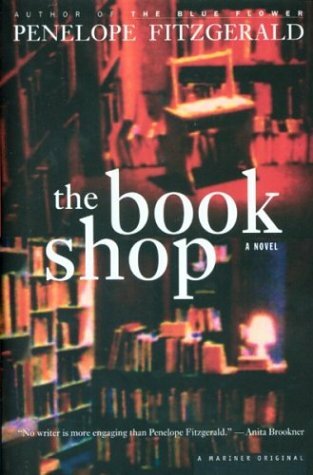 Although published in 1997 and set in a small town on the Suffolk seacoast, it makes me wonder where we are as a civilization when the universal themes of self-preservation and indifference still make us jump as though we've heard the "rapper" in Florence's bookshop banging around upstairs. What is to become of us if a small, local bookshop cannot flourish? Think of it as a pub crawl, but with less beer and with more books. As readers, we all understand the importance of frequenting bookstores - whether it is the indie bookseller, the used bookstore, or the megastore that sells toys, coffee, bargain books, bookmarks, the kitchen sink, etc along with popular titles. Our first visit was Strand in New York City. Located at the corner of 12th and Broadway (hours and full address can be found here), the walk from Midtown was just as much fun as the books. Our journey took us past the NYU buildings, cupcake shops, and Washington Square Park. 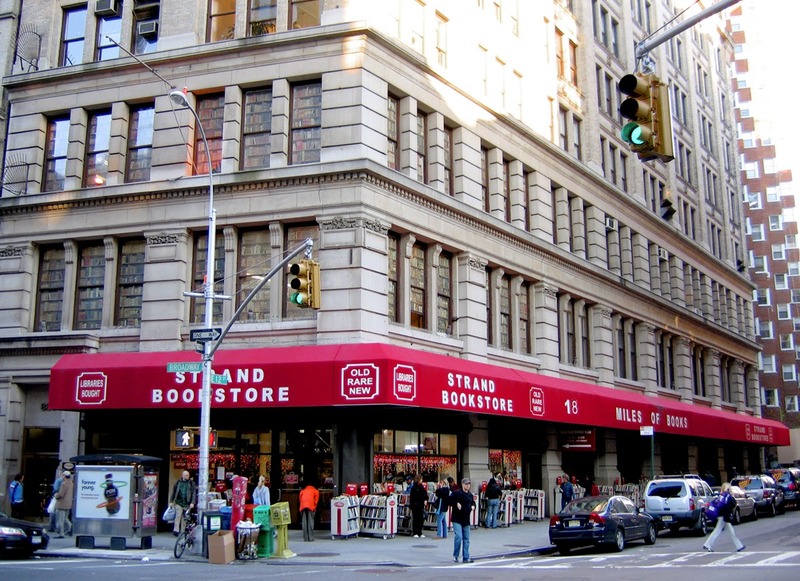 Strand boasts that it covers 18 miles of books. That sounds strange at first, but one look at the storefront will change all that. The area is mixed with newer commercial stores, independent shops and the usual Art Deco-inspired look represents New York; Strand BELONGS in NYC. If you can get past all of the cheap books set up in front of the doors and finally make it inside (because those books do look tempting), you will be rewarded with reader nirvana. I recommend walking slowly through each aisle, visiting each floor, and speaking with the staff in order to get the most out of your Strand experience. The ground floor offers popular titles, dusty volumes, fancy hardcovers, tote bags and cute reader accessories. The second floor is for the YA titles, graphic novels, art books (I called this the "creative floor"). The basement is the academic selection. Every topic for any discipline and the tables are organized in an easy-to-find fashion. Most of the staff that I spoke to were NYU students (mostly English majors) who loved books and loved their job. They LOVE to discuss what they were reading and they were eager to help me find any title. There is something to be said about bookstore employees who love to read. You don't get that with the megastores, but I guess that can be said about most indie/local stores? Despite the 18 miles of books, it doesn't feel like an arduous undertaking. Rather, it creates a treasure hunt where book-lovers can soak it all in before choosing their book selections to take home. As always, I found myself wishing for more eyes so I can read every book that I noticed (and I don't care how weird that would look). Thank goodness I was taking the train home - it prevented me from buying a ridiculous amount of books that I couldn't carry. Like one of my favorite places to go in Princeton, Strand offers popular titles, but it also offers many academic titles. I'm not talking about the academic textbooks or peer-reviewed articles that make up my job, but the gender, cultural, social, political studies that make up very interesting books and ideas. Everyone can benefit from these books - even if one does not see his/herself as an "academic." If you wish to learn it, then read about it. It's nice to see bookstores allowing this transition to happen smoothly and at the reader's pace. ---> Strand has lots of really cute messages on their bookshelves. This is one of them, and I have to admit, that I agree with it. (this may also stem from my years as a bookseller back in college, where I spent a good two hours after closing cleaning up after the store patrons before I could get on with my closing duties). What I love about this picture below is the comparison between the Strand price and the Kindle price. I don't mind e-readers, but I did enjoy seeing how a good, tangible book can be cheaper than the technology we love so very much. 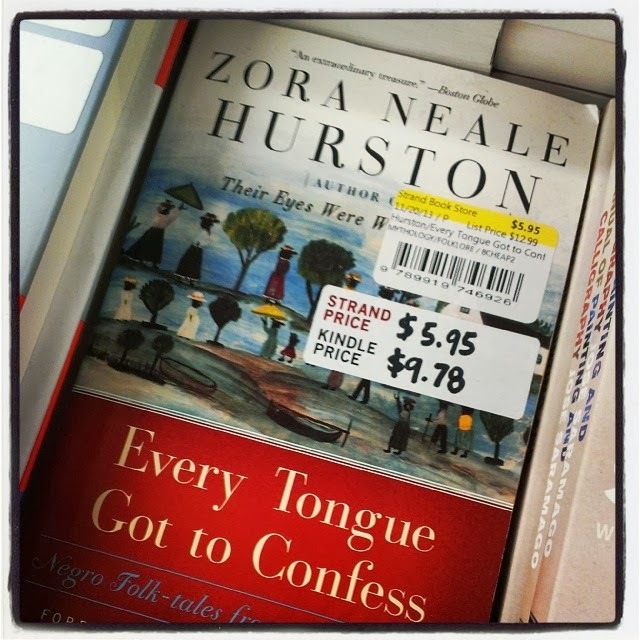 Also, this is a great Zora Neale Hurston book.